If you work or live on a farm, this question probably comes up just about every time you lose your pocket knife and search for a replacement. What is the best pocket knife for farmers? This got me thinking about what pocket knives fit most farming tasks well and how you should go about finding one for your homestead. A good pocket knife should be easy to carry everywhere on a farm and complete a wide range of tasks. Farmers need a sharp blade for cutting twine, rope, feed bags, vegetables, and just about anything else. Pocket knives should also hold an edge and be simple to sharpen when the time arises. In this guide we’ll take a look at some of the best pocket knives to use on a farm, what I’ve seen others use, and ultimately what really works well. Two of the knives that I’ve found best for farming are the Spyderco Tenacious and Kershaw Leek. Let’s look into these two knives to see what makes them great for farmers and why you need one. What Makes a Good Pocket Knife For a Farmer? For a pocket knife to be able to accomplish all these tasks on the farm, it must be razor sharp and able to hold an edge. Blade material should be made out of quality steel and adequately hardened to hold an edge well. While pocket knives can do a lot, nothing is as versatile as a multitool. We’ve had good luck with the Leatherman Supertool 300 as a great all around farm tool. Not only is the knife sharp, but it contains 18 other tools that can do almost anything. If you’re looking for more than a knife, a multitool might be your answer. Click here to see the Super Tool 300 at Amazon. We’ve found several pocket knives that stand up well to the wear and tear that farming causes on equipment. Below are our top two picks for the best pocket knives for farmers. Spyderco makes many great knives, but the Tenacious is a tried and true farm knife. It truly lives up to its name as a dependable knife that keeps coming back for more. Click here to see it at Amazon. Its blade is constructed of 8Cr13Mov stainless steel which is corrosion resistant and tough as nails. The G-10 laminate handle is reinforced with steel liners for added strength. Designed for the repetition of farm tasks, its handle is molded for ease of use to cut down on fatigue. 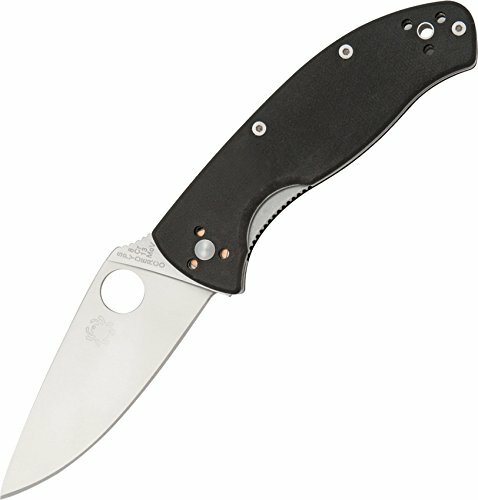 The oversized Spyderco Round Hole allows you to open the knife easily with one hand so you can multitask. The Spyderco Tenacious meets all of our requirements as a great farm knife by being sharp and dependable. It won’t let you down. Kershaw produces some really good pocket knives and the Kershaw Leek is at the top of the list right now. The Kershaw Leek has a 7 inch overall length, 3 inch blade length, and weighs just 3 ounces. This means it’s the perfect size for carrying in your pocket and light enough that you won’t know it’s there. Constructed of 410 stainless steel, you won’t have to worry about corrosion or rust. This pocket knife will last a long time. The blade is made of Sandvik 14C28N steel, which takes a fine edge and holds it well. It’s also easier to sharpen than a S30V type blade. 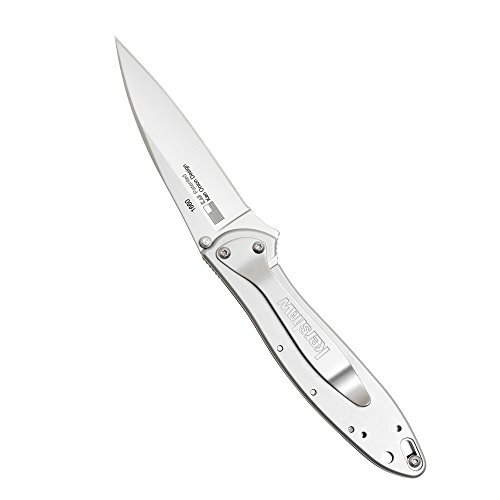 The Kershaw 1660 Leek Folding Pocket Knife comes with Kershaw’s improved ergonomic feature called Speedsafe. If you have never used a Kershaw Pocket Knife with Speedsafe before, it’s a great little feature that lets you open it with one hand seamlessly. It’s really simple to master and you can flip the blade open by using the raised assist very quick and easy. The Kershaw 1660 Leek Folding Pocket Knife is a great design with an even better look. Its sleek style makes it great for a pocket knife that will not snag and it clips with ease to hold in place. It’s made in the U.S.A. with the quality of Kershaw and great for the farm. The best pocket knives for farming must be sharp and dependable since they are used almost every day. They must be able to accomplish many tasks, such as cutting twine, rope, and feed bags. Our top picks for the best pocket knives for farmers are the Spyderco Tenacious and Kershaw Leek. These two knives have proven themselves over years of use on farms across the country. Check out more Outdoor Product Guides and Reviews on our Blog! OutdoorProductGuide.com is a participant in the Amazon Services LLC Associates Program, an affiliate advertising program designed to provide a means to earn fees by linking to Amazon.com and affiliated sites.